Yesterday afternoon I had another enjoyable conversation with New York City gallerist Bill Bace. In 1990, Bill hosted a retrospective exhibition of Jim’s work, Fragments 1962/1986; Pieces of a Joycean Quilt. The gallery card for the exhibition can be seen in this previous post. Our conversation went to the fact that we are essentially, for the first time, bringing Jim’s life and art to the attention of his home state, Indiana. I mentioned that it was as if we were finally discovering Jim. He immediately mentioned that we were rediscovering Jim. Bill made the point that Jim has a history as a legitimate artist that was producing the highest quality of work in the vernacular of his generation. Also, Jim’s work had a viable market via his representation at the Ruth White Gallery. This makes our job less complicated. It’s not as if Jim’s work has never been seen by the public and we are discovering an artist and his work for the first time. Indeed, we are rediscovering an acknowledged, recognized artist. So, the “new” title for our book is, Style, Elegance and Wit: Rediscovering the Life and Art of James Spencer Russell. 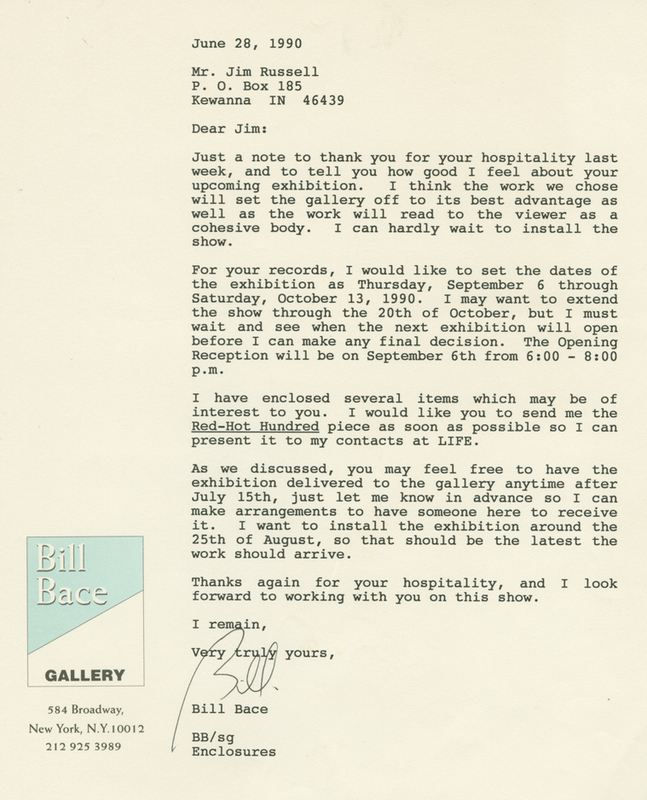 A little background about talking with Bill Bace about Jim – While doing research we went over what Jim had saved from his 1990 exhibition at Bill Bace Gallery. 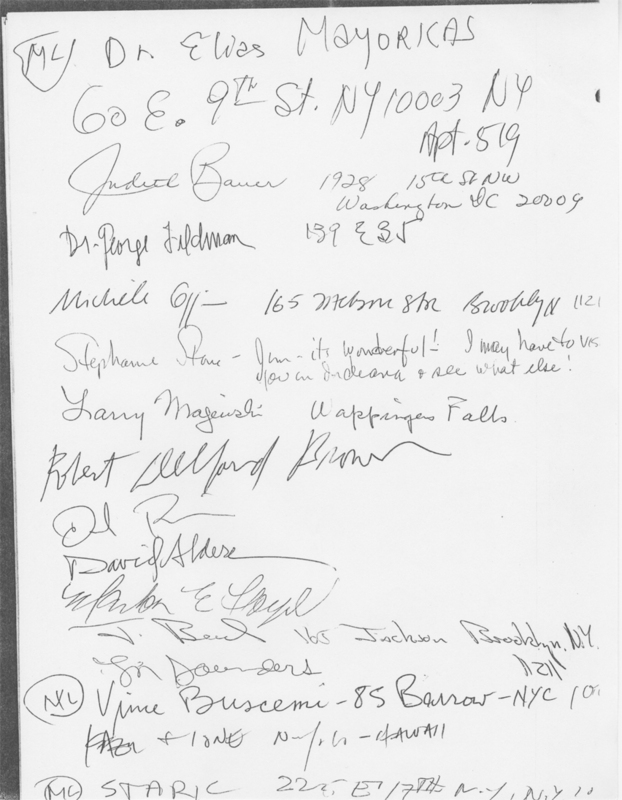 There was a lot of material, letters, receipts, copies of sign-in sheets from the exhibition’s opening reception, etc. 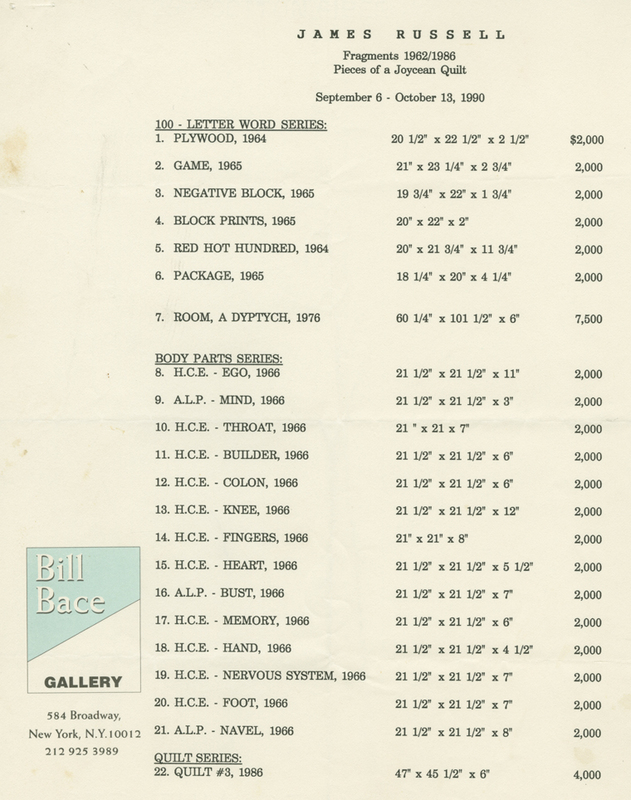 Thinking that it would be awesome if we could talk with a gallerist that had showed Jim’s work, on a lark I looked up “Bill Bace” in the New York City white pages and found a number. I dialed the number. As the phone rang, I mentally rehearsed my upcoming apology for bothering this person. The phone was picked up after only a few rings. I introduced myself and asked if I was speaking to Bill Bace. After an affirmative answer, I explained why I was calling and immediately Bill jumped in and we had a wonderful conversation about Jim and his art and how Jim fit into the art scene during his time exhibiting in New York City. He also clued me in on the New York City art gallery business. Bill’s perspective and advice was essential in guiding our future research that eventually revealed Jim’s life as a person and as an artist. 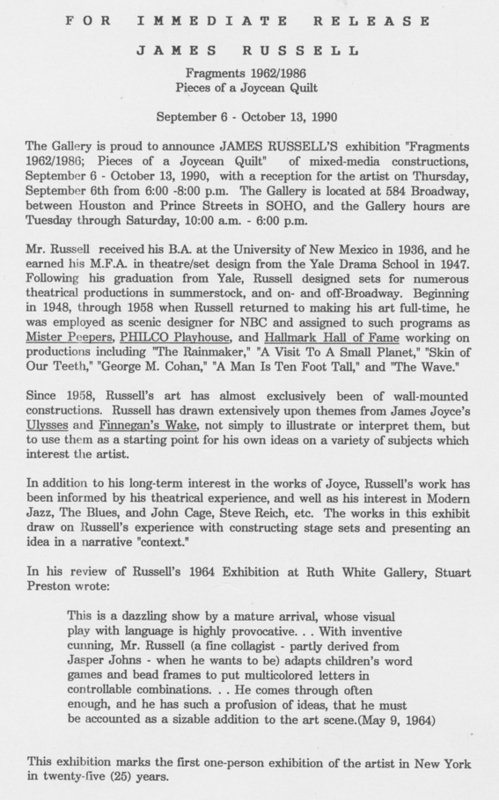 Below are a few documents from Jim’s 1990 exhibition at Bill Bace Gallery from the collection of Wade Bussert. Click on the first thumbnail to access the gallery. Hi Kelly. Unfortunately I don’t have a list, but if you Google around you can find artists that have his gallery listed in their resumes.